Kaylie Scheinman is an associate in Herrick’s Real Estate Department. Kaylie’s practice is focused on commercial finance. She represents banks and other lenders, as well as individual and corporate borrowers in all aspects of commercial secured and unsecured financings, including sophisticated real estate financings and asset-based loans with syndicated, co-lender or single bank credit facilities. Kaylie also represents parties in real estate joint ventures. 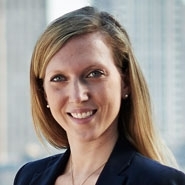 Before joining Herrick, Kaylie was an associate at Windels Marx Lane & Mittendorf, LLP in New York.